Conrad's Multimedia Press is the only press on the market that prints all mediums, including stone lithography, which is not possible with traditional presses. Change from intaglio to lithography in as little as five minutes. This floorstanding press is built to last forever, with heavy, one-piece steel beam construction, a composite bedplate, and a solid steel lower roll. The upper roll measures 4½" (114 mm) in diameter. The entire unit is easily disassembled into component parts for cleaning and relocation. An optional steel stand and 4" (102 mm) casters provide a sturdy home for the press, as well convenient portability. 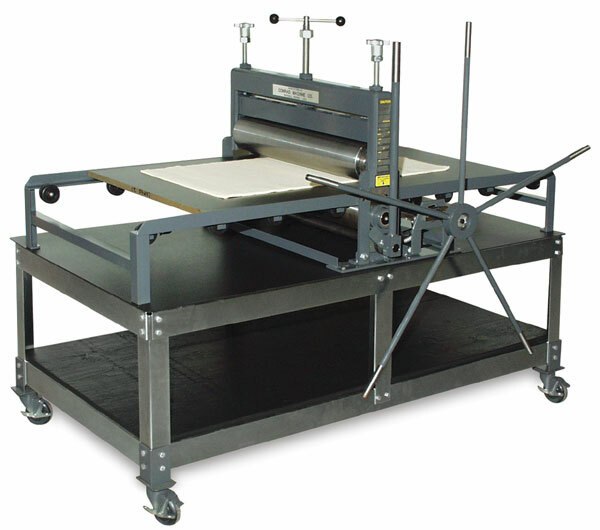 C25 Etching Press — Has twin torque drive and 4:1 gear drive with 4-spoke star wheel. 27" × 48" composite bedplate. Shipping weight is 550 lbs. C16 Etching Press — Includes a handle crank and 6:1 gear drive. 16" × 32" composite bedplate. Shipping weight is 220 lbs.  Conrad is a trademark.